Delegate: Mr. Luis Hilario Alonso Mijares , Ministry of Industry, Energy and Tourism. 2018 has been a beneficial year for ocean energy in Spain. Several ongoing projects showed progress on reliability of ocean energy (a new full year operation at Mutriku Wave Power Plant feeding electricity to the grid), marine operations and improvements under OPERA Projects, several developments on corrosion and fouling resistant coatings being tested at the Marine Corrosion Test Site “El Bocal”, a new offshore facility – HARSHLAB – placed at BiMEP to test materials, some off-grid wave buoy testing at PLOCAN and Punta Langosteira Test Site (a new test site at the Galician coast). Anyway, there are still several barriers to remove. Ocean energy needs to demonstrate the ability to improve on efficiency, reliability and feasibility to be considered as a potential contributor to the future energy mix supply. And it needs a stable legal frame and proactive policy to push forward the development of the sector. During 2018, the Spanish Government started to work on the Energy and Climate National Integrated Plan 2021-2030, and the Energy Transition and Climate Change Law. Both, likely to be approved during 2019, will fix targets for 2030 and new rules to boost renewable energy in general and, hopefully, ocean energy specifically. Nowadays, the energy policy relays on the new Ministry for the Ecological Transition and the main permits needed to develop an ocean energy power plant (environmental, use of the marine space, energy production) have to be approved by this Ministry. Currently, there is no specific organisation responsible for the implementation of any Ocean Energy programme, because up to now Ocean Energy has not been a priority in the Spanish policy. The Basque Government approved in 2016 its Energy Strategy for 2030, which included a specific initiative to speed up technology and commercial development for marine energy and set a target of 60 MW by 2030. Law 21/2013, of 9 December, establishes a simplified process on Environmental Impact Assessment for all marine energy projects. There are no specific market incentives for ocean energy in Spain but for renewable energy installations in general. The Basque Energy Agency (EVE) launched a new call of its “Demonstration and validation of emerging marine renewable energy technologies” programme in 2018. As previous calls, the programme has a budget of €2,5 million for a maximum of 3-year duration projects. IK4-Azterlan, IK4-Gaiker and Mikra Recubrimientos S.L. are working together with RISE Institutes Innventia, REPOL, WavEC, CorPower Ocean AB and Skandivavisk Ytförädling on the OCEANIC project focused on the development of corrosion and fouling resistant coatings for ocean energy structures, which are being tested at BiMEP open sea test facility. 2018 brought the launch of the second and third calls for trans-national access to European offshore renewable energy test facilities within the MARINET2 project. This project, funded by the European Commission under the Research Infrastructure section of H2020, has the participation of 7 Spanish partners: BiMEP, CENER, CTC, EVE, IH Cantabria, PLOCAN and TECNALIA being the Marine Corrosion Test Site “El Bocal” of CTC one of the most required test facilities so far. WESE is an EASME project that will collect and process environmental data from three wave energy devices installed in Spain and Portugal in order to improve the modeling capabilities, develop a licensing guide and facilitate the selection of possible locations for the implementation of this type of technology. TRLplus is a Retos Colaboración project approved by the Spanish Ministry of Science, Innovation and Universities that aims to create innovative and highly competitive services to boost the offshore energy sector to the future market, supporting developers and side industry involved during the whole life cycle of an offshore farm. BiMEP is an open sea test area located off the coast of Armintza, in the province of Bizkaia. Operating since June 2015, BiMEP offers technology developers an offshore area with suitable wave and wind resources, thereby enabling the demonstration and validation of the technical and economic viability of different concepts of energy converters, equipment and materials prior to commercial development. 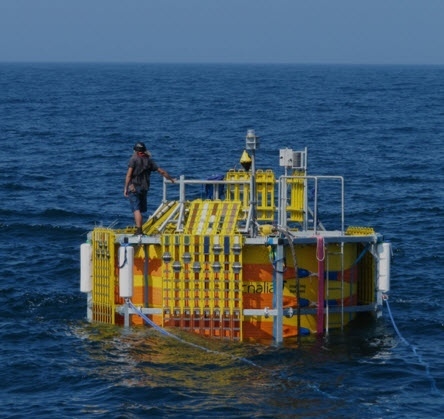 BIMEP hosts the first floating wave energy device connected to the grid in Spain. 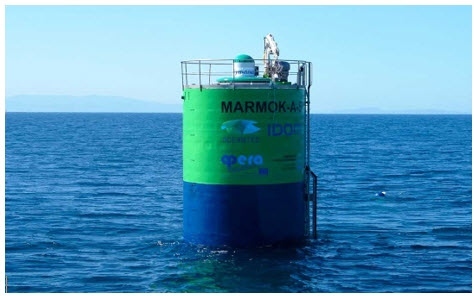 The so called MARMOK-A-5 device developed by OCEANTEC (acquired by IDOM in September 2018) was initially installed in 2016. After surviving two winters, the device was towed in for refitting and integration of the different innovations that have been developed in the OPERA project. In October 2018, the device was returned to it mooring site at BIMEP to collect more data for benchmarking. IK4-AZTERLAN and TECNALIA also developed some material tests, the former under the OCEANIC project funded by OCEANERA-NET. Mutriku Wave Power Plant is the first multi-turbine wave energy facility in the world. It is integrated with the breakwater of Mutriku (Basque Country) and based on the OWC (Oscillating Water Column) principle. It has 16 air chambers and 16 sets of “Wells turbines + electrical generator” of 18.5 kW each. The plant was connected to the grid in July 2011, reaching a record of cumulative energy from waves powered to the grid of some 1.77 GWh. Two of the air chambers are prepared to test OWC components (air turbines, electrical generators, power converters and control systems). Until August 2018, the Portuguese company Kymaner continued testing its bi-radial air turbine. This novel turbine was completely designed and manufactured in Portugal, with a total investment value of circa €1 million, and represents the culmination of the development of a patent originated in IST- Instituto Superior Técnico, protected in several countries interested in wave energy. The turbine prototype has been specifically developed and tested under the EU project OPERA. Mutriku wave power plant has also adapted its premises to better host technology developers during their tests. HarshLab is an advanced floating laboratory for the evaluation of standardized probes and components in an offshore environment developed by TECNALIA. It is suitable to test new materials and solutions against corrosion, ageing and fouling in real and monitored conditions. The first version of HarshLab was installed at BIMEP in September 2018. It can handle up to 125 samples in atmospheric zone, 320 in splash and 320 in immersion (765 probes in total). TECNALIA is working on a second version with more functionalities for testing components and subsystems applicable to offshore technologies, including ocean energy. WEP+, Ocean ERANET Cofund project, continuation of UNDIGEN and UNDIGEN+ Project, is a wave energy conversion demonstration project based on the industrial scale W1 (WEC by Wedge technology), accumulating roughly 4 years of testing at PLOCAN on the Canary Islands. The W1 system configures itself as an axisymmetric resonant point absorber with an innovative direct drive power take-off (linear generator). 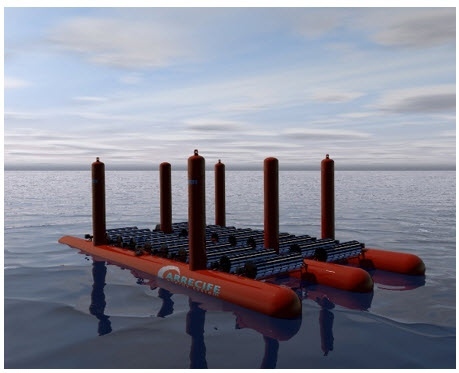 Wedge Global, jointly with CTC and DEGIMA has also been developing SMARTWEC Project, aiming at optimizing wave energy converters point absorber type by increasing offshore reliability and energy output. LifeDemoWave is a wave project developed in Galicia. Funded by the European Commission (LIFE+), the main objective of LifeDemoWave project is the demonstration of the feasibility of the use of wave power for electric generation in order to reduce greenhouse gas emissions. For demonstration purposes, a prototype of wave power generation and two different PTO to test, 25 kW each, have been developed and installed in the Galician coast (2 PTO to be sequentially tested in one hull). The prototype was deployed in June 2018 for a no grid connected test. 6 Spanish entities take part on this project: Quantum Innovative, Universidad de Vigo, CETMAR, Hercules Control, ACSM, and Grupo JOSMAR. Galicia-based Magallanes Renovables has been tested its 2 MW floating platform for tidal energy at EMEC in Scotland to validate the technology, study O&M costs and approach the market. BLUEGIFT is a project approved by Interreg Atlantic Arc which will implement a coordinated ocean energy technology demonstration programme that encourages longer term demonstration and technology de-risking across the Atlantic Arc regions. ARRECIFE plans to test its first AT-0 1:2 scale prototype at BiMEP during the summer of 2019. This test will serve to perform the first validation tests with a system without connecting to the grid. ARRECIFE technology is a floating system similar to a catamaran or trimaran that uses a series of turbines to transform wave energy. The system is designed to work optimally with wave heights of 1 to 5 m in height and is scalable and modular for different power capacities adding more rows of turbines or combining several modules. ARRECIFE also incorporates an immersion mechanism that is activated when the waves exceed 5 meters in height, ensuring the ability to survive during storms or adverse conditions of wind and sea. The Wave Energy Basque Country group supported the organization of the Ocean Energy Europe 2018 conference in Edinburgh with a gold sponsorship. The Basque Country, through EVE – Basque Energy Agency - entered the SET-Plan Ocean Energy – Implementation Plan (IP) group. This Implementation Plan was adopted by the SET-Plan Steering Committee on 21 March 2018. In September 2018, IDOM CONSULTING, ENGINEERING, ARCHITECTURE, S.A.U. completed the takeover of OCEANTEC, including 100% of staff and key assets like the MARMOK-A-5 prototype deployed in BIMEP. IDOM has stated it will continue with the Oceantec’s activities as well as its commitment to fulfil all the R&D projects formerly involving OCEANTEC. The Master in Renewable Energy in the Marine Environment (REM) is an Erasmus Mundus Joint Master Degree (EMJMD) offered by four universities: University of the Basque Country, University of Strathclyde, Norwegian University of Science and Technology and École Centrale de Nantes.These partner universities jointly engage in the overall execution and development of the Master. Each centre is responsible for the operation of the programme at its own institution. The Master is co-funded by the Erasmus+ Programme of the European Union. The Basque Government took over the presidency of the Marine Renewable Energy working group of the Atlantic Arc Commission in 2017. The creation of this group is the result of the growing interest for MRE in the Atlantic. EVE, TECNALIA and BEC (Bilbao Exhibition Centre) worked during 2018 with the Basque Energy Cluster on the organisation of the fourth edition of Marine Energy Week as part of a wider maritime event “World Maritime Week”, which will take place in Bilbao in February 2019. There is no specific Marine Spatial Planning (MSP) policy. Pre-selected areas for ocean energy development have not been defined. Site selection is carried out on a case-by-case analysis. In the Basque country, in the case of Biscay Marine Energy Platform (BIMEP), a MSP approach was used for selecting the site. • Regional governments can participate in the process depending on their competences. In particular, regional governments (there are 17 in Spain) are the decision-making bodies when the site is in internal sea areas (i.e. sea areas lying between two capes). The total time needed to obtain approval is approximately two years but this timeframe varies between projects. For instance, consenting of BIMEP started in July 2008 and ended in 2012 with the concession of marine-terrestrial public domain and the authorization for project execution. In contrast, the consenting of the Mutriku wave power plant took less than two years as it is located onshore and consequently was subject to the consenting process applicable for an ‘ordinary’ renewable energy plant. The reason for such time variability to obtain the final consent is attributed to whether an Environmental Impact Assessment (EIA) is required or not. The new EIA law in Spain since 2013 aims to reduce the time scale needed for obtaining the Environmental Authorization, establishing a time period of no more than 4 months, or 6 months if there are justified reasons, thus reducing significantly the time needed for this consenting process which was about 3 to 24 months according to the previous law from 2008. The Ministry of Industry, Tourism and Commerce, through the Energy Policy and Mines Directorate-General, is the decision-making body and it is responsible for granting the administrative authorization. However, in practice, there are more bodies involved in the process and developers need to deal with them. An EIA is assessed on a case-by-case basis. According to Law 21/2013, of 9 December, all projects devoted to the production of energy on the marine environment are subject to be evaluated through a simplified environmental impact assessment process. The entity responsible for the decision on whether an EIA is required or not is the Ministry of Agriculture, Food and Environment. There are not too many experiences related with EIA baseline and post-monitoring steps. The most interesting case can be BIMEP where an environmental monitoring plan was carried out. For example, this included monitoring activities during the installation of the electrical cables. In Spain, no dedicated consenting process exists ocean energy technologies. The consenting process is based on three main legal instruments that are briefly outlined here. - Exploitation Authorization (EA) – allows the installations, once the project is installed, to be powered up and proceed to commercial exploitation. • Law 2/2013, of 29 May, for protection and sustainable coastal use and amending the previous Coastal Law of 1998. It provides the legal framework for occupation of the territorial sea, as well as governing issues affecting the fishing sector and safety conditions for maritime navigation. Management and surveillance competences relating to the Public Maritime Domain on Land (MTPD), which includes the territorial sea, rest with the General Council on Coast and Ocean Sustainability which forms part of the Ministry of rural, Marine and Natural Environment. Coastal Demarcation Departments are their representatives in each coastal province and Autonomous Community. Therefore, the development of electric power projects in the territorial sea must comply with the legal requirements governing the administrative process for granting titles to territorial occupation (prior to and during the project development) and associated arrangements (e.g. deadlines, transfers and expiry. • Royal Decree 1028/2007 – it is simplified for ocean energy since a competitive procedure between promoters (which applied for offshore wind) is not considered for ocean energy. It is clear to applicants what permits are required, in what order and what information must be supplied at what time, but no specific guideline (single document) is available for developers. Deployment at Bimep is already pre-consented so developers do not have to submit a full application comprising all the typical consents providing certain initial conditions are met.